Updated: it didn’t long for us to return to The Broad Chare, read about there here! Terry Laybourne (MBE) might be an easy target, being the “Gordon Ramsay of the North East” and all, but no one can argue with the quality of the food in his (now five) restaurants, and this new pub is certainly not one diluted step too far. The menu, like the bar area, is small but well thought out. A bar menu/lunch menu serves the downstairs area, and a full dinner menu is offered in a more additional restaurant upstairs. Available at the bar was one of the most extensive beer collections I’ve ever seen – quite an impressive variety of beers on display, and a good wine menu. Local classics from Wylam are available on tap. Rather than trying the Sunday lunch we ordered mains of crab sandwich (£6) and prawn, grapefruit and chicory salad (£9.50) with sides of scotch egg (£2.50), handcut chips (£2.20), middlewhite pork scratching and bramley sauce (£2.50), and handraised pork pie (£2.50) – a pub tasting menu if ever there was one. Basic but lovely, full of fresh dark and white crab meat. Brown bread was light and fresh but could maybe have done with some crunch. Lacking even a (token) garnish! The best I’ve ever had – runny soft egg coated in lovely meaty sausage with a crispy bread rump outside – absolutely the perfect pub snack; will be returning for many more of these. Similarly, the chips were divine, salty and crunchy, we could have easily gone through a bucket full of these. The pork pie was thick crusty short pastry wrapping a ham-hock like inside, so meaty and filling. It came accompanied with a great, tangy piccalilli, Apparently one of the chefs and focuses of the restaurant is pickles and pies, so I hope to see great pies and pickles like this. Couldn’t comment on full service as we dined in the bar area, but the staff were knowledgeable and our food arrived quickly and warm, and presented well for what it was. On weekdays they are offering pub classics, like a fish and chips Friday, and more pies and roasts. With “bar snacks” this good, I will certainly be heading to the upstairs restaurant to try one of the bigger plates. 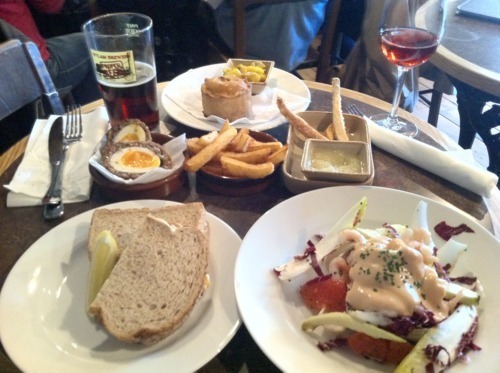 Go and check out those scotch eggs.